The Way of Agape is an extensive look at what the Bible has to say about God’s Love. This classic work by Nancy Missler is not just academic, though. Nancy started this study in order to understand how God’s Love had saved her marriage and her life. It is a work that is not just intensely practical, but also a very personal testimony. Study guide is now included in the textbook! The Way of Agape DVD Seminar. Wouldn’t it be great to experience a seminar done by Nancy Missler? Now you can! With this DVD set you can have a great EIGHT HOURS with Nancy showing you the insights that she wrote about in her book. LEADER’S DISCOUNTED PACKAGE. This package is great for Bible Study Leaders. Textbook now includes the study guide questions inside the book. DVD includes 8 hours of teaching within 8 sessions. Leader’s Guide is a three-ring binder with instructions for facilitating, questions and answers for the study guide, along with a CD-ROM disk so you can print out the charts on your computer to enhance your teaching and study. I hope this email finds you well. I bought The Way of Agape for download. It worked great. But then I got a new phone. I downloaded Adobe onto my cell phone and was reading it there. Is there any way I can get it on my new phone without having to purchase it again? I live in South Africa, so postage makes purchasing the hard copy impractical. I am almost finished with learn the Bible in 24 hours with Dr. Chuck and was then planning on reading Nancy’s book. God bless the Missler’s and all of you! Your DVD’s are they NTSC or a region 4 for Australia to watch? Also what is the postage for Brisbane, Australia. Thank you. What are your rules for sharing downloads? I would like each of my family to have a copy of the way of agape teaching and my husband is wondering g if we can duplicate the conference?? I sure miss all of you. Think of you a lot. Love you guys. My daughter and I want to do this study together. We have purchased the book, DVDs and workbook. How do you recommend we use the book and DVDs together? Read the corresponding chapters in the book and then watch the DVDs or the reverse? Any help would be greatly appreciated. I now wish I would have ordered the leader’s discount package at least for one of us so then we would have the leader’s guide which, I’m sure, would have been beneficial. Oh well. Thanks again for any help you can provide! Thank you for purchasing this life changing message of God’s Love. With the DVD you should have received a corresponding outline that goes along with the book. For Example; Session one of the DVD teaching corresponds with chapters 3 & 4 in the book. We suggest that you read the chapters first then listen to Nancy’s teaching. We pray that this helps you both on your study of God’s Love. Any further questions you can contact us at the ministry at 866-775-5464. I JUST WANT TO THANK GOD FOR YOU ALL, FOR THIS GREAT SITE AND VERY IMPACTFUL. I PRAYED THAT GOD SHOULD CONNECT ME TO A SITE WHERE I CAN STUDY DEEPLY AS GOD HAS CALLED MY HUSBAND AND I INTO THE WORK OF THE MINISTRY,SPECIFICALLY ON AGAPE AND ETERNITY. WE ARE YET TO RESUME,BUT IN A LITTLE TIME FROM NOW,YET I FELT I NEED TO STUDY AND I CAN SEE THE HUNGER IN ME TO KNOW MORE. I WAS SURPRISED FEW MINUTES AGO TO HAVE DISCOVERED THIS SITE,GOD BROUGHT ME HERE.CONFIRMING HIS ASSIGNMENT.GOD BLESS YOU ALL AND I WILL BE NEEDING YOUR MATERIALS TO DEVELOP BIBLE STUDY SERIES AND MESSAGES,FOR THE TASK AHEAD. Hi, is there a download I can buy of just the charts for Chapter 10? I have everything else but I lost the disc that had all of the charts on it. Great to hear from you too Lori. Someone here is always talking about the Way of Agape study. It has so impacted so many women here. I hope and pray all is well with you and all those connected to The King’s High Way. How is Nan? Last we saw you your schedule was totally filled. God has equipped you to handle all that. I do hope you get rest every now and then. 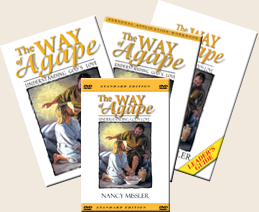 I am considering ordering the downloads of the Way of Agape. What I need to no is that once I order it will it be sent by way of email? and will it be printable? I already have the books but feel the downloads may be better. I pray that this will help in our study that we began next Wednesday. I have done this study previously, approximately 15 years ago and look forward to being a leader this time. I was not aware of Nancy having cancer. And I can relate with her because I too had myoplastic breast cancer 2 years ago with a 30% percent chance of survival. As I announced to the wonderful doctors that Christ put in my life, my God is the ultimate physician. And he, only he, knows when it is time for me to come home. From the first day that I knew I had cancer I was never afraid. I knew that I must walk by faith and with Christ I did. I will continue to do so daily. We now have a cancer support group at our church and I pray moment to moment that each of our family within our group will too realize that God will carry us when we cannot walk. It was so nice to talk with you today! Keep in touch and let us know if we can assist you with anything else. We always love to hear testimonies from the Bible Studies. We also agree with you that Jesus is “The Great Physician” and may He continue to bless you with Divine health, favor and grace! Blessings as you as you teach and lead others in God’s Word!